Consecrated in 1980, this modern building is redolent of Ireland’s past and reminds one of Newgrange. It was designed by Patrick Rooney & Associates of Sligo and Dublin. It is constructed of random quarried stone commonly found locally. The 34 metre roof span is achieved by the clever use of laminated spruce beams. The foundation stone of this church was blessed by Pope John Paul, on the occasion of his visit to Knock in September 1979 and laid in position by the Bishop of Elphin, Most Rev. Dr. Conway, on the feast of St. Joseph the worker. The organ was made by Kenneth Jones of Glendalough and Bray, 1981. The above church replaced an 1876 neo-gothic church designed by George Goldie (who also designed Sligo and Ballaghaderreen Cathedral), it had a magnificent pitch pine, hammer beam style roof, and a striking rose stained glass window above the alter. It took over six years to build after laying the foundation stone, at a cost of approximately €8,000. The church was accidently burnt down in 1977. 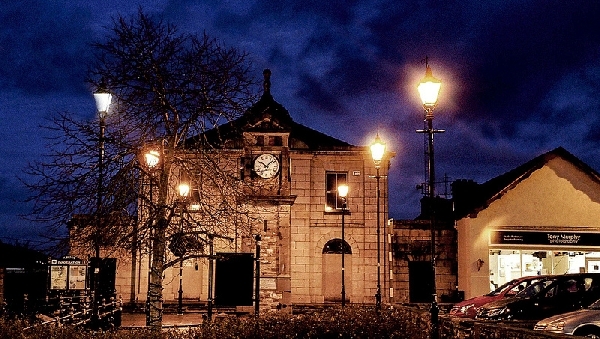 Prior to 1876, the Catholic Church was on the other side of Boyle in St. Patricks Hall.